An updated version of the paper chain, this 3D bauble-like garland can be made from wrapping paper leftovers, newspaper, music paper, recycled Christmas cards; anything! 1. Materials needed 2. Cut circles of paper 3. Fold with pattern on the inside 4. Glue the back of circle halves 5. Stick circles together 6. Continue until four circles are glued together. Punch a whole bunch of circles from the paper. Fold each piece in half with the pattern on the inside. Glue the outside of the folded piece (the “wrong” side), leaving a couple of millimeters from the fold bare of glue. Stick to the wrong side of another folded circle to create a “T” shape when open. 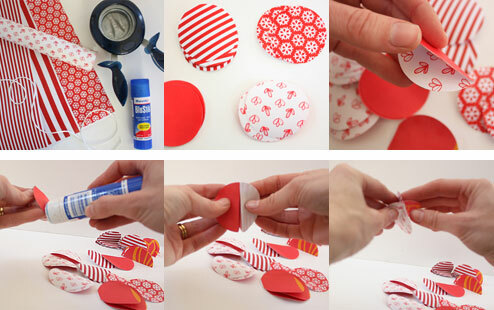 Repeat with the other sides until you’ve used four pieces and formed a bauble. Try two different patterns in the one bauble, or a single pattern for each bauble and alternate when threading together. Use a thick mattress needle to thread the string through the centre of each bauble (there should be a gap right in the middle that wasn’t glued). We mixed our baubles up with small beads.